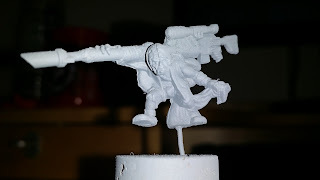 I built this sniper dude using parts from the ogre kingdoms range.. I really like the way he turned out and I think that he makes a better ratling sniper type than those dwarf based models that I made a while back. Oh well. Ho hum. That reminds me I should finish painting my Gnoblar conversions!